Fun is the key word here! 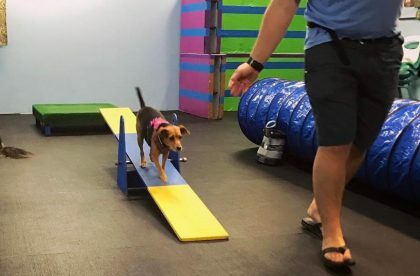 Both you and your dog will have a blast as we teach them to jump over hurdles, run through tunnels, and balance on the wobble board. Since this class is for fun and not competition-focused, you can also expect to see additional fun obstacles peppered in throughout the class. This is to help your dog continue building confidence on uneven surfaces or jump through more than just a standard hurdle. You might see a skateboard, an inflatable exercise/stability ball, hula hoops, and more! Do you have a shy or fearful dog? 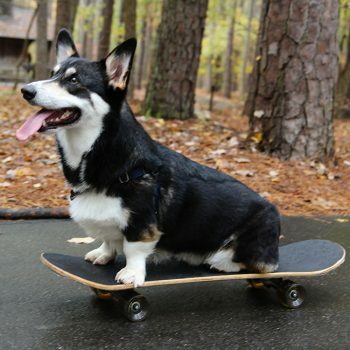 Agility training is one of the easiest and most enjoyable ways to build confidence and help their personalities bloom! A great option for high-energy dogs, owners who don’t have a fenced-in backyard to play in, or for teams just looking for a new way to bond and something new to try. All of our Agility for Fun classes are held indoors, in a temperature-controlled facility, so you can run and play no matter the weather. Little dogs, unite! If your dog is under 30 pounds, it sounds like our Tiny Tots Agility would be a great fit for you! Look for the Tiny Tots title on the products below to know if the class is specifically for dogs who weigh less than 30 pounds.